Introduction: Abortive RSV replication occurs in in vitro cell lines and animal models in presence of the monoclonal antibody Palivizumab. Naturally present RSV antibodies are known to wane giving rise to the possibility of reactivation of viral replication. Aims: The study was to determine whether latent RSV might be reactivated in a cell culture model by Palivizumab removal. Methods: HeLa cells at 80% confluency were infected with fluorescent-tagged RSV (MOI: 0.003-3) and cultured in the presence of Palivizumab (400-6400ug/ml). Appearance of fluorescent indicates production of a fluorescent protein and is a marker of replication. Culture medium was replenished every five days (with or without fresh Palivizumab). The fluorescence emitted intracellularly by RSV virions was tracked and analysed by the Incucyte® Zoom System (Essen BioScience). 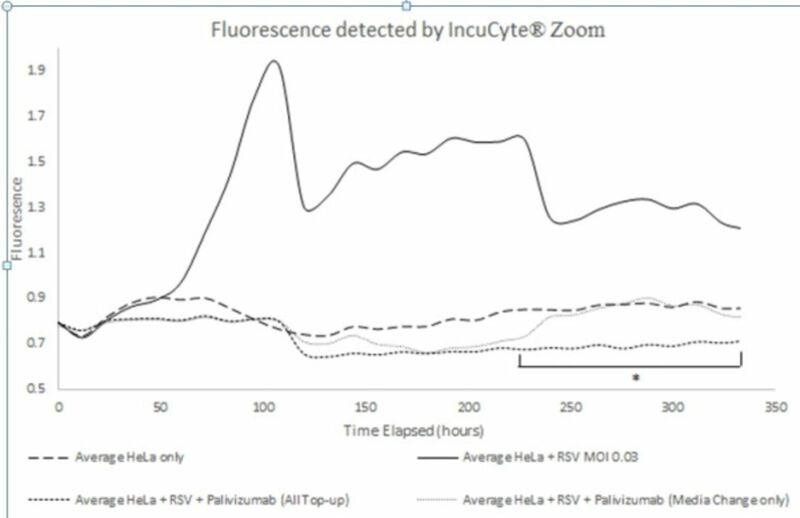 Results: Uninfected HeLa cells had minimal fluorescence (long dashed line), whereas HeLa+RSV MOI 0.03 had maximum fluorescence at 100-hour culture (solid line). Fluorescence was lower (p<0.05) in HeLa+RSV continuously cultured with Palivizumab (short dashed-line) compared to those without Palivizumab (dotted line) from 228-hours of culture onwards (*). Conclusions: This data indicates that RSV replication reactivation occurs after RSV antibodies are removed from the system and this may be relevant disease susceptibility in humans.